Yesterday, the Olympic Torch arrived in San Francisco, California — American soil. The America I believe in not only stands for human rights, but has gone to war to protect them. The America I believe in helped to create the Universal Declaration of Human Rights in 1948; a declaration written by a United Nations General Assembly committee chaired by Eleanor Roosevelt. The America I believe in has a government that remains firm and strong on its support of the Universal Declaration of Human Rights being observed and enforced — universally. With President Bush’s announcement that he will be attending the 2008 Summer Olympic Games in Beijing, it is critical that he not attend solely for his own privilege and enjoyment, but as a representative of a country that believes in, stands for, and fights for the rights of ALL humans to enjoy the freedoms stated in the Universal Declaration of Human Rights. In the past few months, China’s horrific actions in Tibet have been the worst force of power since the Cultural Revolution. As Americans, the time to act is NOW. As Americans, the time is NOW to tell our president that he MUST act as a representative of the people of the United States of America when he attends the Summer Olympics in Beijing . 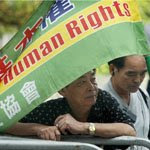 Join your voice along with thousands of others as Amnesty International USA urges President Bush to pressure China for human rights improvements BEFORE the Olympic Games. I encourage you to sign your name to Amnesty International USA’s letter to President Bush. The spirit of the Olympic Games is at stake. The lives of innocent people are at stake. The America I believe in is you, me, your neighbor, my neighbor, and so on. The America I believe in is its strongest when we are standing together as one defending freedom.